Ah! The lazy days of summer. Who are we kidding? Most of us don’t have lazy days, even during the summer, but there are those wonderful times when our schedules are light or even empty. Empty days are the best because they’re filled with so much promise. We can do with them as we will. The trouble is, empty or “blank” days without a schedule can quickly get away from us. It doesn’t take long to think of things you’d do with an empty day. Maybe you’d write in your journal, take a long walk, or picnic in the park. Perhaps you’d choose to work on a hobby, read a good book, or learn a new recipe. If your planner is blank and you’ve got hours to kill, schedule that time. Give yourself the freedom you want by scheduling it into your day. That way, you’ll ensure you have the time to do some of those things on your wish list. A Progressive Task List is the perfect place to write all the things you’d like to do, create, learn, or try if only you had the time. Keep that list in your planner and refer to it whenever you have a few spare hours. You’ll be surprised at what you can accomplish over time. 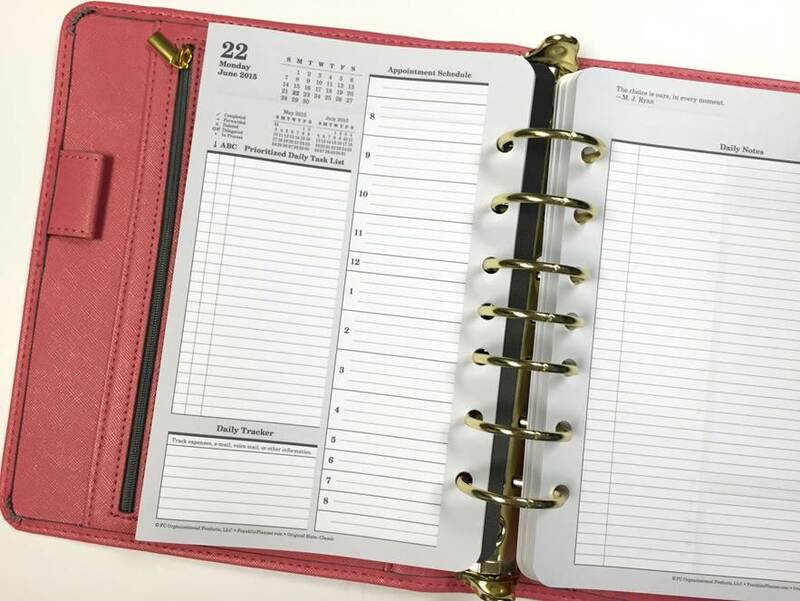 Planning works best when it’s a daily habit, so even on empty days spending a few minutes in your planner will keep the habit strong and keep you moving happily toward your goals. Empty days are a great time to add vision to your goals. Use your empty planner page to bring more life to your dreams. Thumb through catalogs and magazines and find images that represent the goals you have for yourself. Cut them out and paste or tape them onto your page. Some people call this a vision board. Perhaps you want to build a pergola in your back yard, run a half-marathon, get into better shape, or paint a bedroom—you’ll find all sorts of great images to represent those goals. This exercise is a great way to increase your motivation to work toward your goals. As you do this, you will often come up with things you can do right then, during your empty day, to get you closer to realizing your dreams. Have you taken any pictures during the last month or so? Print them off and tape them onto the days that the events happened. It will make revisiting your planner that much more fun later. While you’re enjoying your empty day in the sun, take some time to reflect on the things you’ve done and learned in the past couple of months. Think through your recent events and see if you can find things to be grateful for. Note these learning moments and opportunities in your planner. This kind of reflection is a great way to feel grounded and it helps you appreciate the amazing life you live. Benjamin Franklin has said, “Lost time is never found again.” Keeping track of the things you’d love to do on your lazy days is a great way to ensure your time isn’t wasted—even if you spend it in a hammock with a good book.